Survival is a struggle for the Rohingya refugees. THE people of Myanmar suffered tremendously under a harsh military regime, but to this day the Rohingya minority in the northern Rakhine state remain the most persecuted - stateless in their own homeland, said independent documentary filmmaker Mahi Ramakrishnan. Mahi's 30-minute documentary - Seeds of Hatred, highlights the persecution of Rohingya Muslims and the discrimination faced by other ethnic groups in Myanmar. The director who spoke to theSun recently, said filming footage at the Rohingya camps was a heartbreaking experience as she witnessed the devastation around her. "They are struggling to survive. There is no future for the children as long as they live in these camps. 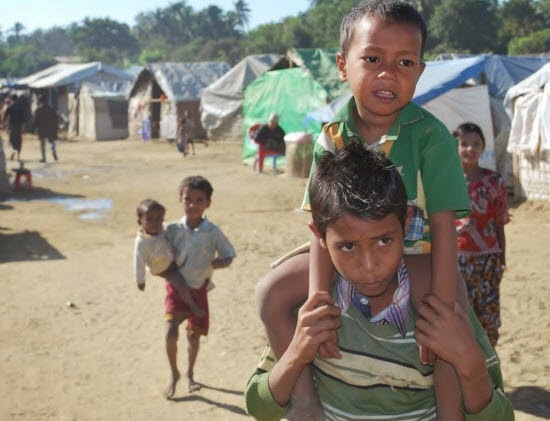 The Myanmar government must recognise the Rohingya as citizens so that they can return home. "The government has to make sure the violence against them stops," she said. Mahi went through many hurdles to get into the camps to film her documentary. "The security is very tight and I had to wait for weeks just to get proper papers from the authorities to shoot at the camps. This was made possible by my friend and human rights activist in Myanmar, Shine Win," she said. When asked if her life was ever in danger while shooting the documentary, she narrated an incident where she was asked to leave a hotel she was staying in. "When the owner of the budget hotel I was staying in heard that I was doing a documentary on the Rohingya, he got furious. He threw my bags onto the street. "He shouted that I was putting his life in danger by staying at his hotel. He threatened to call the military on me, if I did not leave. That evening, I had to search for another hotel. I was worried sick that he may have actually informed the military," she said. Mahi who worked as a journalist for 18 years before becoming a documentary filmmaker, says she hopes Seeds of Hatred will help start the process of national reconciliation in Myanmar. Seeds of Hatred will premiere on Thursday at the ASEAN Peoples' Forum Film Festival in Wisma MCA at Jalan Ampang. The screening will be held from 8.45pm to 10pm. Admission is free. The photographs Mahi took at the Rohingya camps will be showcased at a photo exhibition at the Bentley Music Auditorium in Mutiara Damansara on May 9 from 10am to 2pm. Proceeds from the sales of her photos will be donated to a refugee school in Ampang. The exhibition runs simultaneously with an investment conference organised by Jessica Wee, founder of the Tutor a Refugee Child programme. All proceeds from the conference will go to registered refugee schools in the country.